I created this Kale, Artichoke and Pecorino Salad the other day with ingredients I had in the house as a side dish for company. Everyone just loved this dish! Adding the Pecorino right before serving gave the salad and extra flavor that made this dish very yummy!! Give it a try! You can omit the cheese to keep it Paleo! Take panchetta and chop. Heat a saute pan over medium heat and add in 1 tablespoon of olive oil. Saute pancetta until crisp – about 7 minutes. Using a slotted spoon remove panchetta and place on a plate lined with a white papertowel. Using the saute pan over medium heat add in artichokes and cook for 2 minutes on each side. You really just want them to brown a little. Remove from pan and set on a plate. 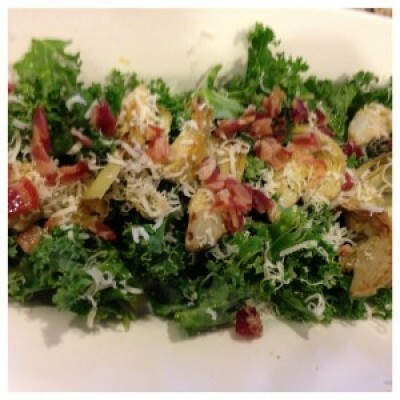 In a large bowl or serving platter add chopped kale, Then add in artichokes and pancetta. Drizzle with olive oil (about 3 tablespoons) then add lemon juice, salt and pepper. Toss together. Using your Kitchen IQ grater top with Pecorino cheese.